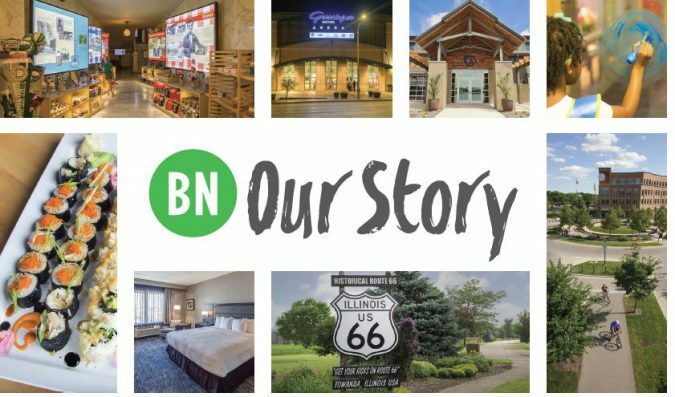 Our mission at the Bloomington-Normal Area Convention & Visitors Bureau is to enhance the region’s economic vitality, sustainability and quality of life by marketing McLean County as a compelling destination. Through the direct efforts of the CVB, we welcomed an additional 207,194 visitors last year. We received $584,500 in hotel tax dollars. For every $1 of hotel tax received, $10.60 was returned to the local economy. This led to an economic impact of $6,243,120. These visitors also impacted our economy by eating at our restaurants, shopping in our stores and visiting our attractions. In addition, we had 613,209 visitor inquiries this past year. Our staff worked hard to promote the Bloomington-Normal area not just regionally, but nationally. Convention and Tourism Sales Manager Samantha Morehead traveled to the American Bus Association in North Carolina, Midwest Marketplace in Wisconsin, the Route 66 Miles of Possibility Conference in Carlinville and the ISAE Convention Trade Show and Summer Session in Springfield and Peoria. Sports Marketing Manager Matt Hawkins traveled to the Sports Illinois Huddle in Rock Island and the National Association of Sports Commissions Sports Events Symposium in California. We were also represented at the Twin Cities Showcase, ISU Preview Expo and the Illinois Governor’s Conference on Travel and Tourism. We advertised in multiple publications that had a combined circulation of 1.5 million. These publications included Midwest Living, Travel Illinois and the Chicago Sun Times Summer Guide. We created Facebook advertisements that reached over 96,000 people. Our Partners in Promotion program helped local events attract visitors from outside of our region, including the Illinois Shakespeare Festival, Sugar Creek Arts Festival and the American Passion Play. Looking ahead to 2019, we have several new events coming to BN, including the B-Town Throwdown, a pickleball tournament that will be held at the Evergreen Racquet Club. We had the privilege of sitting on the Downtown Bloomington Wayfinding Signage committee. These signs, as well as a gateway Arch to downtown, will be installed later this year by the City of Bloomington. Look for a new Route 66 Experience Hub in Downtown Bloomington at the corner of Main St. and Jefferson later this summer, which will be installed by the City of Bloomington. This Route 66 Experience Hub will attract new Route 66 Visitors. Thank you to all those who contribute to our BN story as you are making it one to be proud of.